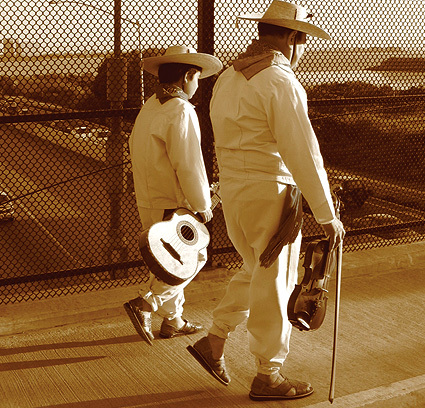 Pasajero, a Journey of Time and Memory takes the viewer on a heartwarming musical and cultural journey through the experiences of a group of young Mexican American musicians, singers, and dancers, who accompany their mariachi maestro on his homecoming to Mexico. Pasajero is a powerful reminder of the vital role that music plays in defining our identities. Recently-widowed Julian Gonzalez left his native village in Jalisco, Mexico, to start a new life in Northern California. There he not only found a new home, but an opportunity to impart his unique knowledge and love of pre-commercial mariachi music and dance to the young students of the Los Cenzontles Mexican Arts Center in San Pablo, California. He instills in them the cultural importance of this infectious music, rooted in the traditions and heritage of rural Mexico. “Pasajero successfully combines music with storytelling, creating a tale of forgotten Mexican tradition told by the folks who lived it and the young people struggling to reclaim their heritage,” says filmmaker Les Blank. The film resonates with both Mexican immigrants and US-born Latinos, as well as with non-Hispanics, and transcends cultures, borders, and generations. It truly demonstrates the universality of music. Pasajero features performances of rarely seen mariachi roots music and dance, as well as commentaries by musicians and scholars, including Nati Cano; Dan Sheehy, Director of Smithsonian Folkway Records; and Chris Strachwitz, founder of Arhoolie Records. The one-hour documentary was directed by Mexican Richard Braojos. Producer Eugene Rodriguez, a third-generation Mexican American, is also the founder and executive director of the Los Cenzontles Mexican Arts Center, based in San Pablo, CA. This bi-national collaboration was funded by the James Irvine Foundation and Cultural Contact. Eugene Rodriguez formed youth group Los Cenzontles in 1989 and incorporated the Arts Center in 1994. He received a Master’s degree in Classical Guitar performance from the San Francisco Conservatory of Music in 1987. In 1995 he was nominated for a Grammy for Best Musical Album for Children for his production of ‘Papa’s Dream’ a bilingual recording with Los Lobos and Lalo Guerrero. He has produced thirteen CDs for Los Cenzontles. Additionally he produced and performed on Mexican folk group Mono Blanco’s CD entitled ‘El Mundo Se Va a Acabar’ on Urtext Records.